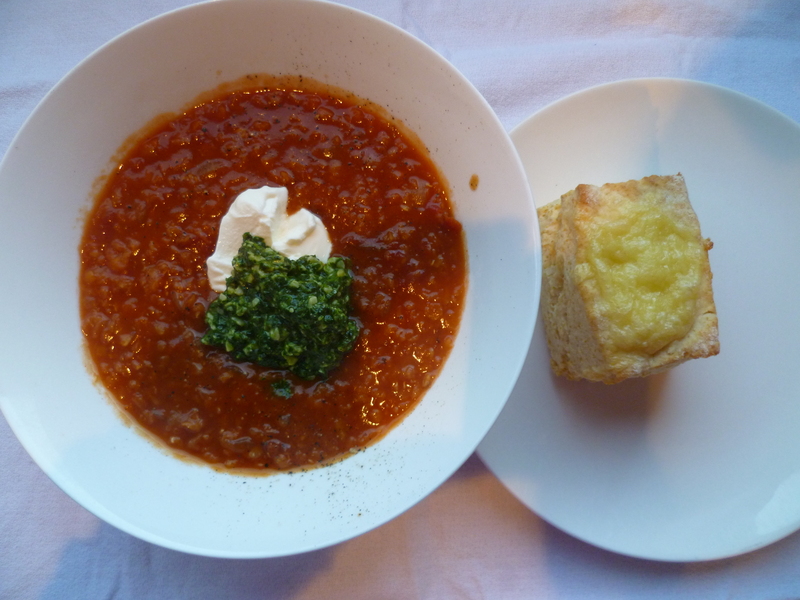 I have shared this recipe with a lot of people before, but it is still our favourite soup. Both girls like it, although Miss 6’s version of “like” is to eat two helpings of it, while Miss 4’s version is to dip her scone in it! It is cheap, can be vegetarian, full of protein and great for winter lunches and dinners. It takes a little bit longer than 45 minutes to make, so may not be suitable for busy week days. I always make scones in the food processor – much easier than rubbing butter in and getting covered in dough! These go really well with the soup, and make instant dessert with jam or marmalade on them. 1. Heat oil in a lot on low heat. Add onion and garlic and saute stirring until onion is soft. 2. Add the paprika and cook for a few seconds. 3. Add all other ingredients except for the coriander/sour cream and simmer for around 45 mins until lentils and mushy and cooked. Stir occasionally to avoid lentils sticking to the bottom. 4. For the kids I put theirs in the fridge for 5 minutes to cool down more quickly. For the adults serve with cracked black pepper and sour cream and/or coriander. I used coriander pesto in the picture as I had some in the freezer I had made. 1.Turn oven to 200 C fanbake and grease an oven tray. 2. Add the flour and baking powder to the food processor and pulse to mix. 3. Add the butter and cheese and pulse to combine. 4. Add the milk and pulse to mix. Your dough should be a bit sticky but not runny. 5. Turn the dough onto a floured surface. Turn to coat both sides in flour and then roll out to 2 – 3 cm thickness. 6. Cut into squares and place on the greased tray. Top with grated cheese. 7. Cook for around 10 mins. They should be golden and cooked through. 8. Serve scones on the side of the soup – great for dipping!